AICS is the acronym used to describe the Accuracy International Chassis System for the Remington 700 Model Rifle. It was designed by and for competitive shooters for for long range competition and military applications. One of the biggest drawbacks of the AICS has been the cost of the magazines at well over $100. Well that is about to change. 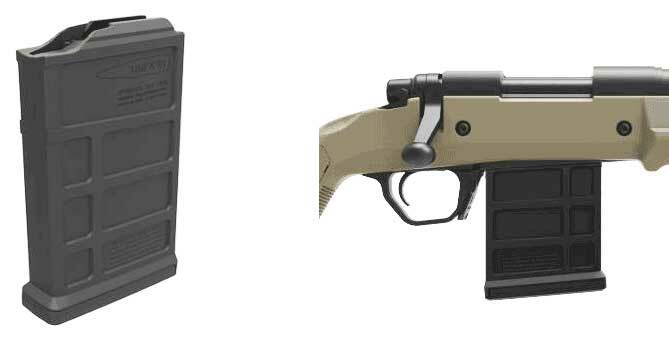 Magpul has once again done what they do best and introduced a magazine, the PMAG® 10 7.62 AC AICS Short Action. If the PMAG® 10 7.62 AC – AICS Short Action proves reliable in the field it will no doubt at $35 be a game changer for Remington 700 and AICS shooters. The PMAG® 10 7.62 AC – AICS Short Action is a reliable and durable polymer magazine compatible with AICS spec bottom metal. Built using M3 technology, the PMAG® 10 7.62 AC – AICS Short Action is advanced in both material technology and manufacturing processes, and we’ve given it more features to make it the most advanced, reliable bolt action magazine on the market. Accuracy International was started in 1978 by a group of national and international target shooters, one of which was a two time Olympic Gold Medalist. Designed by shooters, for shooters, the Accuracy International Chassis System (AICS) presents Remington 700 owners with an advanced chassis system that is not only superbly functional but ergonomically inclined as well. The rugged platform of the AICS combines the leading characteristics of steel and polymer. Featuring a full-length, aluminum, self-aligning, self-bedding vee block this system more than supersedes traditional bedding practices.